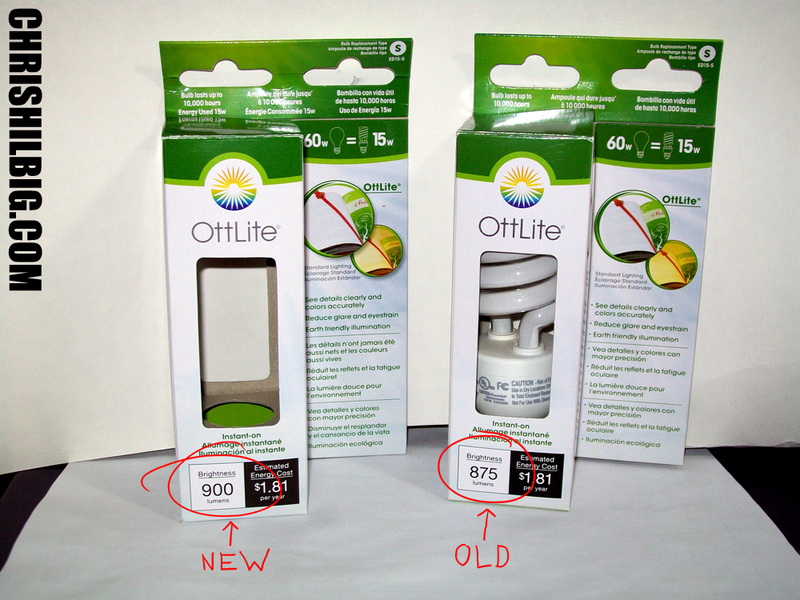 Not too long ago, I wrote a review on the OttLite 15 watt CFL lightbulb. I honestly wasn’t overly impressed, but I kept using it due to the fact that it produced a cleaner light and allowed for me to see color more accurately than with my GE Reveal incandescent lightbulb. I had contacted OttLite Technologies support staff asking if I could safely use a higher watt bulb in my 60 watt lamp. The answer was no. The assumption was made that I had a bad bulb, and I was offered a replacement (since OttLite bulbs come with a year warranty). So I took advantage of it. About a week later, I received a new OttLite 15 watt bulb in the mail. Shop MisterArt’s Bestsellers Starting Black Friday Through Cyber Monday for Lowest Prices of the Year! When I opened my new package, the first thing that jumped out at me was that the brightness listed on the box was 25 lumens more (900 lumens) than the original bulb. (875 lumens) Lumen is basically a measurement of the amount of light emitted from a light source. (It’s actually much more complicated and convoluted, but that’s the layman’s explanation.) The more lumens, the brighter. The replacement bulb is definitely much brighter than the original. I’d say the brightness is on the level of my incandescent bulb. This is a major plus. I need lots of light while I work. The 900 lumens bulb produces richer colors. This is quite noticeable from the inkjet print of the geishas. The white of the copy paper is much brighter and cleaner. Comparing both of the OttLite bulbs to the GE Reveal, the yellow cast is painfully obvious. The colors don’t seem as clean and saturated under the Reveal incandescent bulb. A sample taken using an OttLite 900 lumens bulb. Photo taken with a Kodak Easy Share C913 digital camera with flash disabled. A sample taken using an OttLite 875 lumens bulb. Photo taken with a Kodak Easy Share C913 digital camera with flash disabled. A test sample using a GE Reveal lightbulb. Photo taken with a Kodak Easy Share C913 digital camera with flash disabled. The replacement bulb also doesn’t produce as much heat as my old incandescent bulb. It is slightly warmer than the 875 lumens bulb. Warm-up time for the OttLite replacement is barely noticeable when I turn on my lamp. I can only assume that my contact at OttLite Technologies was right about my original 15 watt bulb being just “bad”. My replacement 900 lumens bulb is what the original OttLite should had been. I have no problem wholeheartedly recommending the OttLite lightbulb now. You could still get away with using a standard incandescent lightbulb for black and white artwork, but you’ll have a lot more flexibility with the OttLite bulb. This is especially true if you do a lot of painting. You can purchase the OttLite lightbulb today at Amazon, Mister Art, or any good art store.